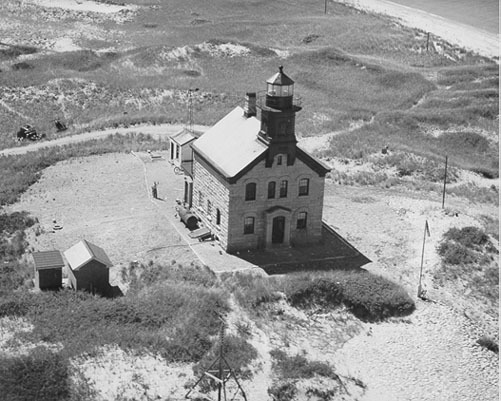 In 1829, the first North Light was built at Sandy Point on the north end of the island. It was replaced in 1837 after it was washed out to sea. In 1857 a third lighthouse was also claimed by the ocean. In 1867, the granite block lighthouse that can be seen today was constructed. It is located a half mile walk across a sand beach from the parking area at Settlers’ Rock. The Town of New Shoreham runs a small Interpretive Center on the first floor with lifesaving displays on loan from the Historical Society. Please call them for hours as they are only open depending on weather and staffing. The Historical Society offers special tours to the site and includes information about both lighthouses.